Who knew the words crispy and baked could go together so well? These Crispy Baked Onion Rings are proof that they do! Who knew that the words crispy and baked could go together as perfectly as they do when I describe these baked onion rings? I’m talking the same type of perfect pairing as peanut butter and chocolate…they just go together so well! I’ve been itching to make some homemade o’rings at home, but really didn’t want to take the fried route. When this baked recipe turned up, I knew I had to try it! On the 4th of July, while most people were likely grilling burgers and all kinds of yummy stuff, I was in my kitchen, with the oven on, carefully prepping these onion rings. While a bit of a hassle to prep (by hassle, I mean I had flour all over the counters, and me, and the floor, and seriously messy hands… but that probably won’t happen to you), these onion rings turned out so crispy and delicious that I don’t think you’ll ever think about frying again. And because they were so gosh darn good, you’ll likely forget about the hassle it was to make them as soon as you take your first bite and hear a real CRUNCH! Originally from Cook’s Illustrated (CI), I tweaked this recipe just a smudge, and got fantastic results. CI calls these oven-fried onion rings because you do start with a small amount of oil on a baking sheet. It’s simply amazing that a small amount of oil can “fry” these onion rings so well in the oven. I served these babies with some homemade onion ring sauce and they turned out to be the perfect side dish for slow cooker pulled pork (recipe coming soon)! Note: These do not heat up well, so plan to enjoy them as soon as they come out of the oven…. which is not difficult….! 1/2 cup buttermilk – room temp. Pre-heat your oven to 450 degrees and adjust the oven racks to lower and middle positions. In a small bowl, combine buttermilk and egg. Whisk to combine. Stir in remaining 1/4 cup flour, cayenne pepper, salt, black pepper, and hot sauce. Using your food processor, pulse the potato chips and saltine crackers until you have a very fine, crumbly mixture. Place half of this mixture in a shallow baking dish and set the other half to the side. When you’re half-way through coating the onion rings, add the rest of the crumbly mixture to the pan. Slice onions into 1/2 inch thick rings. Discard any small pieces of onion. Line a plate with wax paper. Begin coating the onion rings by first dipping each onion in flour. Then dip the onion ring in the batter, allowing any excess to drop off. Finally coat the onion ring with the potato chip/saltine coating. Use your fingers to press the coating to the onion. Place each coated onion ring on the wax paper lined plate. When you’re about halfway through coating the onion rings, prepare two rimmed baking pans by drizzling each with 3 tablespoons of oil. Place the oil coated pans in the oven for 8 minutes. While the oil is heating, finish coating the rest of the onion rings. After 8 minutes, the oil will start to smoke. Remove the pans from the oven and *carefully* tilt each pan so that the oil coats the surface. Divide the onion rings among the two pans. Bake the onion rings for about 8 minutes, then switch the pans around and bake for an additional 8 minutes or until they are crispy. 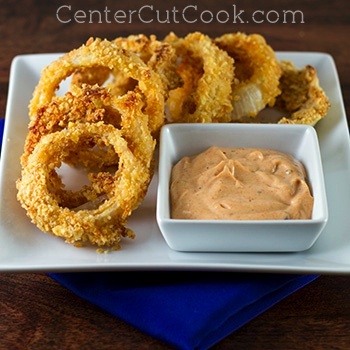 Place the baked onion rings on a paper towel lined plate for a minute or two while you prepare the sauce. In a small bowl, combine all of the dipping sauce ingredients together and mix well. Refrigerate any leftovers.